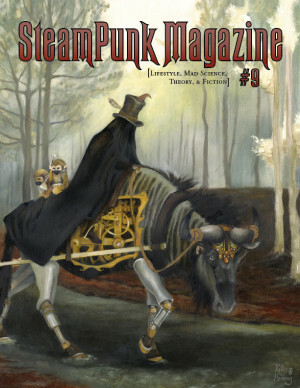 Steampunk Magazine » Calls for Submissions! Steampunk Magazine currently isn’t accepting submissions, but lots of other places are looking for fabulous writers! Here are a few calls for submissions which I’ve been asked to pass along. Steam-Powered 2 is an anthology of steampunk stories featuring lesbian-identified protagonists. (Look for a review of the first Steam-Powered book here on the blog soon, by the way!) The submission period runs from February 1st to March 30th. Femme Fatales is an anthology of mystery stories featuring lesbian-identified protagonists. Submission period is from May 1st to June 30th. The Omnibus Doctor Bill Shakes and the Magnificent Ionic Pentatetrameter is a steampunk Shakespeare anthology, “where Steampunk elements and themes are thoughtfully applied to Shakespeare’s works.” Submissions are accepted until May 30th. sorry, when will issue #8 be available for download? I am a sculpture working in the Steampunk art movement. I would like you to consenter working with me on representing my artwork. If you do not think we could work together, would you link my website to yours or if you could direct me to a more appropriate venue or gallery? I would be grateful. Thank you for taking the time to view my art. I think you may like the artist statement in my Steampunk area. It was written in 3rd person as if I was the great-granddaughter of Sir Arthur Conan Doyle. If you look closely to the art you will see that a lot of the devices where made by people well know to history. Hello, I’m currently working on a number of steampunk stories, and was just wondering if you will be putting up any more story submission information in the future? Sorry, I’m new to this website, and was just curious. I adore steampunk and will be submitting my projects.. glad I found you..